new notification email set-up on form? 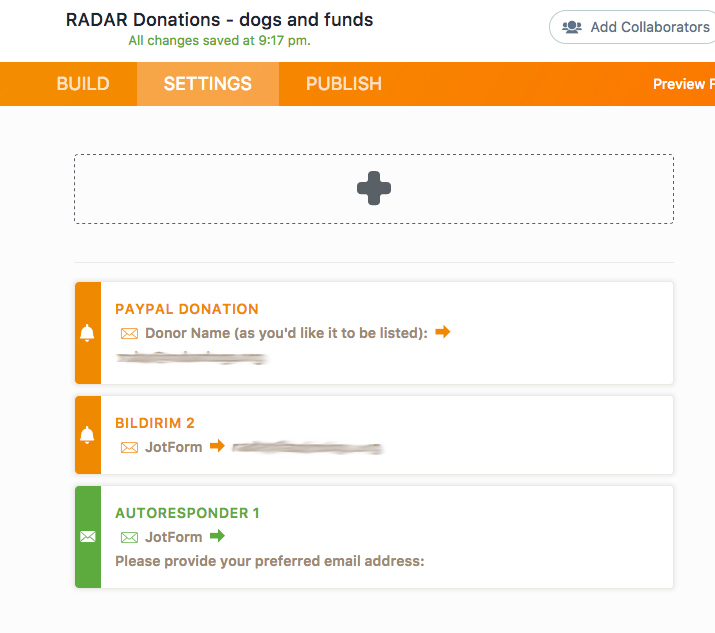 Not sure how or why this happened, but a new notification email was set-up on our donation form. We didn't do this because we already had a notification email set-up. The notification email has a name of BILDIRIM 2. I have deleted it, but am concerned that it's has even appeared on my account. I have included a screenshot from before I deleted it. It is indeed strange that this has happened if you didn't do it yourself, I have checked your form history, and I can see that your form was updated on the 13th of April, do you by any chance remember if you have made this change? Just trying to track the changes made to collect more information on the issue, did the new notification have the same recipient as the other one? The very same thing happened to me. We have a form with conditional logic, and I was getting copied on all submissions. When I looked at the settings for the form, I also had a Bildirim 2 address added with my email. I assume it is safe to delete it, if it was not added by JotForm for a purpose. This is not really an answer, just a "me too." Thank you for reporting this to us, this seems to happen sometimes when we push a new update or fix, and it effects certain forms. If it's the same as your other notification, or you don't want it there, you can delete it if you want, it won't effect your form or your conditions.